Contents: Series editor's preface; Preface; Introduction: A new look at the genre of scientific biography, Thomas SÃ¶derqvist; Presenting a 'life' as a guide to living: ancient accounts of the life of Pythagoras, Liba Taub; Biography as a route to understanding early modern natural philosophy, Stephen Gaukroger; Neither genius nor context incarnate: Norman Lockyer, Jules Janssen and the astrophysical self, David Aubin and Charlotte Bigg; Framing the evidence: scientific biography and portraiture, Patricia Fara; Biography and the reward system in science, Thomas L. Hankins; The tragedy of Comrade Hessen: biography as historical discourse, Christopher A.J. 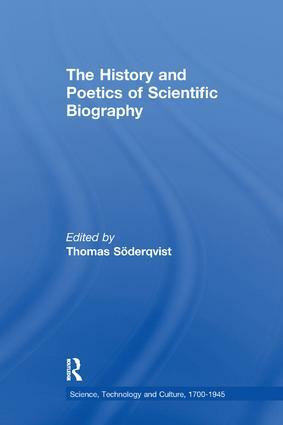 Chilvers; Received wisdom in biography: Tycho biographies from Gassendi to Christianson, Helge Kragh; The programmatic function of biography: readings of 19- and 20th-century biographies of Niels Stensen (Steno), Signe Lindskov Hansen; Discriminating days? Partiality and impartiality in 19th-century biographies of Newton, Rebekah Higgitt; Biographies as mediators between memory and history in science, Bernadette Bensaude-Vincent; 'La mauvaise herbe': unwanted biographies both great and small, Jacalyn Duffin; Primary suspects: reflections on autobiography and life stories in the history of molecular biology, Rena Selya; Pas de deux: the biographer and the living biographical subject, Vassiliki Betty Smocovitis; Resuscitating the 'Great Doctor': the career of biography in medical history, Beth Linker; 'No genre of history fell under more odium than that of biography': the delicate relations between scientific biography and historiography of science, Thomas SÃ¶derqvist; Index. Thomas SÃ¶derqvist is Professor for History of Medicine and Director of Medical Museion at the University of Copenhagen, Denmark.